Shuh Dean Farming & Industrial Co., Ltd.
Professionally Manufactures Various Garden tools and Hand tools. 1. Use: 18T: saw wood. 24T: saw plastic board, PVC tube and aluminum tube. 2. VPA/GS approval, with worldwide patents. 1. Blade: 6" (150mm), high carbon steel blade, 24t/1" and 18t/1" each pc, 0.4mm(t), 6mm wide, high carbon steel, heat-treated blade. 2. 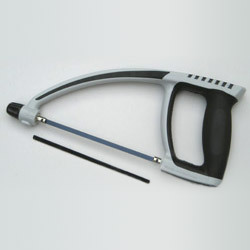 Handle: ABS and TPR plastic handle, iron frame with abs covered. Multi-angle adjustment blade, 45°, 90°, 135° and 180°. 3. Packing: sliding card, 12/48ctn, 12/13kg, 2.4’.